Citi analysts expect the US debt ceiling to be suspended, which pushes back the decision to a later date. However negotiations are likely to continue until the 11th hour, potentially raising the volatility in the financial markets. Citi analysts estimate that the debt ceiling will be hit by mid-October, although an anticipated large payment to the Military Trust may bring forward the timing to early October. Failure to either eliminate, raise or suspend the debt ceiling would result in a default on US sovereign debt. A default would potentially cause the US sovereign credit rating to be downgraded, resulting in higher borrowing costs for the US. 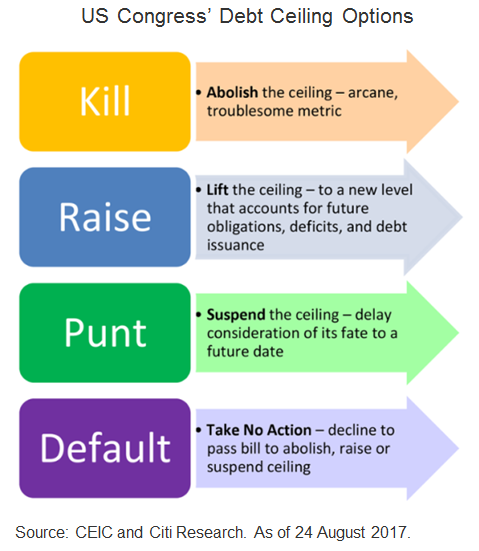 Citi analysts expect the debt ceiling to be suspended pushing back the decision about the fate of the debt ceiling to a later date. This has been the Congress' preferred course since 2012. The Trump administration would probably not want to be responsible for a default on US Federal government debt. Citi places a low probability on the debt ceiling to be eliminated as it has a nearly 100-year tradition and is seen as a tool for fiscal discipline in the wake of the Global Financial Crisis that saw annual Federal budget deficits and public debt swell. However, negotiations over the fate of the ceiling are likely to continue until the 11th hour. Political wrangling can create periods of higher volatility for financial markets. Given steady global growth, low inflation and healthy earnings, Citi analysts continue to favour equities over bonds. However given how much equity markets have rallied year to date, future gains are likely to be more muted. Investors are encouraged to rebalance their portfolios by reducing concentrated exposures.